Glen Sturtevant cowers and sides with the gun grabbers like Michael Bloomberg and Dan Gecker. Sturtevant quote: "We must enforce our strong federal and state gun laws"
My name is Kirby Harris, Chairman of the Chesterfield Tea Party, and I personally endorse Carl Loser for the 10th District Virginia State Senate Seat. He is the only candidate in the Virginia 10th District State Senate Race that stands 100% for our Liberties and Freedoms so long enjoyed by Virginians and Americans. Glen Sturtevant seemed like an OK candidate at first, but then Michael Bloomberg funded ads attacking Sturtevant as being backed by the Gun Lobby. Sturtevant fired back, in his own ad, saying quote, "We must enforce our strong federal and state gun laws". So he is attacked by gun grabbing Michael Bloomberg, and he cowers under pressure, and sells out gun owners Constitutional 2nd Amendment right to own guns. Most of the current VIrginia and Federal gun laws do nothing to prevent gun crime, and only punish and encroach on Americans Constitutional right to bear arms. Dan Gecker is a tax and spend leftist, who wants to raise taxes on Virginians, like he did when he was a on the Board of Supervisors in Chesterfield. His tax hikes hurt my family, and I do not want him to do more damage to families like mine if he were to get into the Virginia State Senate. 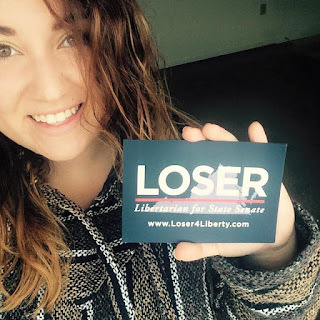 Vote Carl Loser next Tuesday, November 3rd in Virginia's State Senate District 10. If you are not sure if you are in the 10th district, then go to the Where is My Virginia State Legislator Website, then type in your address. Your State and National Legislators will pop up at the bottom. If your State Senate Section says John Watkins, 10th District, then you can vote for Carl.